Almost three years later, Elisabeth took her three-year-old daughter Valerie to live with the tribe of Aucas that had killed her husband. Elliot’s book, The Savage, My Kinsman, is the story of those two years living in the jungle. She wrote a letter on October 13, 1958 to the other widows about her experiences in the first five days: I have now met four of the seven men who killed our husbands. It is a very strange thing thus to find oneself between two very remote sides of a story. To us, it meant everything in life and continues to mean that. To these simple, laughing, carefree forest people, killing five men was little more than routine and they had probably nearly forgotten about it. The story as I have managed to get it thus far, is that the men were all on the beach. The Aucas leaped suddenly out of the forest from behind the tree house and killed them immediately. Oct. 18 - Breakfast this morning was roast monkey. It is quite impossible to bite monkey flesh--you simply clamp your incisors on it and tear). It is a comfort to know that meat is easily digested even if not chewed! Yesterday afternoon it rained and blew hard. I saw again how sensibly these people have adapted to their environment. Of course, the rain blows straight through the house. What does one do? One blows up the fire, hangs up one’s few possessions in a carrying net under the ridge pole and stretches out in the hammock. You get wet, naturally. What matter? The fire keeps you warm and as soon as the wind dies, it dries out your hammock. …the first day we arrived, Valerie just sat down on the log which Kimu was squatting on and stared and stared. Then she said “Mama, who IS that? Is that my daddy? He looks like a daddy.” Somehow, in her child’s mind, she had associated Aucas and daddy--though I’d never told her till a few days ago that the Aucas had killed her daddy. I waited till she had met five of the men and then I told her that those men had killed daddy. She said, “Oh.” She prays for them and for the others she knows by name. 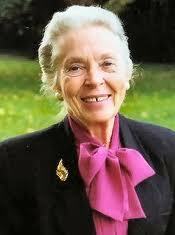 Elisabeth Elliot is suffering with Alzheimer’s in a nursing home. She is a treasure to the church and will be celebrated and missed when she is gone. But her legacy lives on in the books she has written, the radio show she hosted for years, and especially in the lives of the men and women who came to faith in Ecuador through the death of Jim Eliot and through the sacrificial love of his wife. J. Mark Fox is the author of A Faithful Man, his latest book, and the pastor of Antioch Community Church on Power Line Rd. in Elon. You can find all of Mark’s books on Amazon or other online sellers. Email Mark at markfox@antiochchurch.cc. Elisabeth Elliot, Ann Judson, Amy Carmichael, Darlene Deibler Rose, their lives have challenged me. I will be praying for Elisabeth.